Bangabandhu Sheikh Mujibur Rahman Novo Theatre previously it was known as the ‘Vasani Novo Theatre .’ now it is known as ‘Bangabandhu Novo Theater.’ Architect Ali Imam designed it.The Ministry of Science and Information and communication technology of Bangladesh govt. Exposed this planetarium on 25th September 2004 for general people. This planetarium is built on 5.46 acres of land. It is located near on Bijoy Shoroni at Tejgaon, Dhaka. The dome of this astronomers is about 21m of height and 3m of wide. About 275 people can seat here. To eliminate prejudice and superstition from society and for establishing positive scientific ideas in front of people especially students, it is developed as an informal science center. Ministry of Science and It has been set up it on nearly 22096 square meters of land. 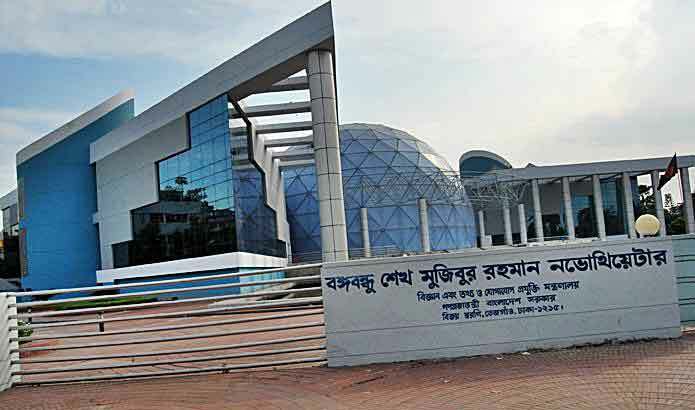 This astronomy center has been prepared on Bangladesh government’s own fund at a cost of approximately 1231.27 million. Sophisticated equipment is purchased from Japan, USA, Korea, Italy. This astronomy center has been prepared on Bangladesh government’s own fund at a cost of approximately 1231.27 million. Sophisticated equipment is purchased from Japan, USA, Korea, Italy, France, and India. There have exciting simulator ride, 5D film theater, 5D interactive edutainment simulator, the planets and the solar system replica, scientific digital exhibition, and renowned scientists portrait. There also have the modern 150- seat auditorium, 50-seat conference room, hydraulic lift, ramp, and underground parking system nearly 100 vehicle capacity. The dome earth and blue sky are enhanced in the planetarium. Visitors enjoy the feeling of losing in the environment of three-dimensional space as well as to the planet. The theater built with the most modern equipment. On the roof, the show curved swirling stars in the sky, and the planets are shown in 120-degree angle Larger screen reflects on these planets. another documentary film represents the 7th March speech of Bangabandhu Sheikh Mujibur Rahman. Visitors don’t need to keep looking at the dome during the show time because there have 150 projectors where the shows go on. Recently one new capsule simulator and smart step floor have been added here. Two different types of documentary film exhibited here. One is ‘Infinite Journey ‘ and the other one is ‘Ai Amar Bangladesh ‘. First one is on the planet, stars, and the sun. Second one reflex the natural beauty, tradition, and the village life of Bangladesh. First one is on the planet, stars and the sun. Second one reflex the natural beauty, tradition, and the community life of Bangladesh. Taking any foods, water, the camera is strictly prohibited. Clicking photograph and entering the theater during show time is restricted. There is four ticket counter in the theater. Two is at the northern side of the entrance of the theater. And two is at the southern side. Entry fee is only 50 BDT per head. Entry for children under the age of two years is fully free of cost. There is an existing ride called ‘simulator ride’ which is worth 5tk per head for five minute riding on it. Usually, before 1hr form, the beginning of the show ticket selling starts. Usually, before the beginning of the show ticket selling starts. Friday: 09.00 am, 11.00 am, 2.30 pm. It remains closed on Wednesday and on all Government holiday. Wednesday is the Novo theater holiday. Friday : 10.30 am, 12.00 pm, 02.00 pm, 03.30 pm, 05.00 pm, 06.30 pm. Toilet facilities and others: At the western side of the ground floor of the theater there has 8 toilets for male and 8 toilets for female. There have sufficient security system, instruments, and fire alarming objects.